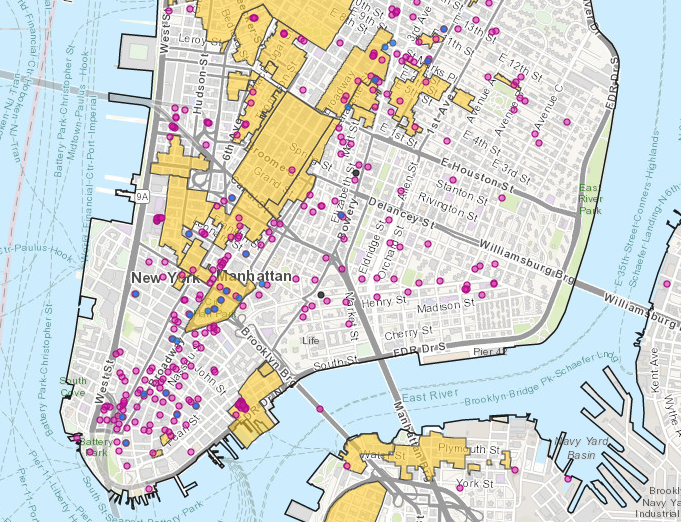 Today the New York City Landmarks Preservation Commission (LPC) launched an enhanced version of its popular interactive landmarks map. If you’ve ever wondered whether the protected building you’re standing in front sports Richardsonian Romanesque or Queen Anne details, now you can get your answer on the spot. The LPC’s map first debuted in March 2016 with the city’s 1,400 individual landmarks. Now, Discover NYC Landmarks also features 141 historic districts (containing almost 34,000 historic buildings). Users can access detailed information, including PDFs of each item’s designation report. The map is accessible on desktops, tablets, and phones, and its updated search feature allows users to filter listings by architect, style, building type, and era. The GIS-based project was designed through the LPC’s Historic Building Data Project and funded by The New York Community Trust.